Today I headed back to the track for some speed work, and decided to do a pyramid workout instead of repeats of a specific distance. I got the idea from Deb over at Deb Runs. At the end of April I asked for your guidance on how to start doing speed training on the track. I got a lot of great responses and valuable information and used it to complete my first track workout at the start of May. A couple days later Deb had a great post called Love to Hate Speed Work that had all kinds of information and pointers about track workouts, as well as example workouts of what she had her runners do. One of those was a pyramid workout, and I filed it away for later. Pyramid-style workouts are not a new concept to me. I grew up as a competitive swimmer and I have done many, many pyramid sets during practices over the years. I always liked them because during the first half of the workout your main focus is getting to the peak distance and then I always felt like I could push even harder on the back half of the set (as the distance decreased). I was looking forward to finding out if the same thing applies with my running. Spoiler alert: it does. The plan for the workout was: 200m, 400m, 800m, 1600m, 800m, 400m, and 200m with a 400m recovery in between each interval. I used the McMillan Running Calculator to figure out what paces to aim for on my 200m and 1600m intervals, since I hadn’t run those distances on the track before. Mr. McMillan told me that based on my most recent 5K time I should aim for 45 to 52 seconds for the 200m and 8:24 to 8:39 for the 1600m. I knew from past workouts my goal for the 400m and 800m should be the low 1:50’s and low 4:00’s, respectively. Going for the record for most links in a blog post here. So with all that being said, I headed to the track with Barry in tow. We did an 800m warm-up, stretched, and then got to work. How about that for even splits? I actually did the first half of the workout on my own, while Barry did his own thing. He ran with me from the 1600 on and really helped me hit those times during the last intervals. I was terrified of the 1600m interval. The last time I did a timed mile was in high school and “Mile Monday” has never been a fond memory of mine. It went well, though. We ran the first 2 laps at a steady pace and then dropped it down a bit from there. Overall I’m happy with how this workout went. I feel like I ran strong and I’m happy that I came in at or under all of my goal paces. My marathon training has me doing one run a week where the middle miles are “marathon pace” miles. I’m guessing this is kind of like a tempo run, so I’m not sure yet how I will make the track workouts fit. Going to the track will probably be an every other week thing, since it does have a tendency to beat up my calves and shins. High five for another track workout in the books! If you played high school sports, did you have “Mile Monday” or an equivalent? Who else is hitting the track or doing some speed work this week? What sports did you play as a kid growing up? If you didn’t play any, what activities did you do? Swimming and soccer as a kid. Field hockey, swimming, lacrosse (only for 2 years), and soccer in high school. Wow! Way to go on the awesome times! And that you went faster in the second half than the first! Last night I did speed work on the treadmill. It was just too hot to be outside even at 7 pm. I did 2 x 400, 1 x 800, 2 x 400, 1 x 800, 2 x 400. I need to mix things up a bit on the treadmill. Thank you! Great job on your speed work as well. I’m not sure I could do speed work on a treadmill. I think I would psych myself out about putting it on much faster speed settings than I usually do. Yay, I’m glad you liked the pyramid! And your times were great! Perhaps for your next marathon (I’m already planning ahead), your body will have adjusted to the distance and speed and you can do track workouts on Tuesdays and tempo runs on Thursdays without beating up your legs. Keep up the good work! Haha thank you for planning ahead for me 🙂 I hope I can get to the point where I can include track workouts and tempo workouts in the same week. I’ve actually done a very similar workout only we did 200-200-400-400-800-800 and back down. I felt like you–the first half you build up and the second half seems easy so you go faster! I’m amazed at your even splits–wow! I haven’t run a time mile since high school. I am curious to do one just to see what I could do! I might have to give that one a try! Doing the mile on the track in the middle of the workout had me shaking in my Asics. But then again, I found it easier than 800’s. Those are tough for me! You definitely should do a timed mile! 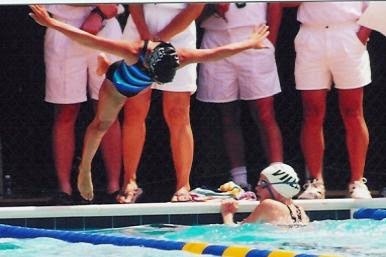 I was also a competitive swimming in high school. 🙂 I always enjoyed pyramid workouts because the hardest part was halfway through – and there was variety, and built in “chunking” (dividing the workout into smaller parts). Major shout-out for those splits – way to lock in to your correct paces, and hit your splits on the nose! Yea pyramids were always a favorite set of mine! I’m happy to find that the same applies to my running. Way to nail yours perfectly symmetrical..except the last 200 which you DEMOLISHED. The only sport I ever played all through school and college was soccer. I even still play on my company’s team, ha. I keep forgetting you used to swim, too. Any thoughts about a triathlon? LOVED all the links! I love it when people link to everything so I can dig deeper. Haha, thanks! That’s so cool that your company has a soccer team you play on. I have considered a triathlon in the past, but I’m not that big into biking unless it’s going on a ride with my dad or with Barry. Plus I barely handle the logistics for a bigger road race (parking, bag check, corrals, remembering my shoes & shot blocks), so I’m not sure I want to deal with all the stuff that goes into the triathlons.